Sometimes we struggle to illustrate the value of risk management. We sense we are doing the right things. How can we show the benefits? Some products such as weight loss programs are promoted by showing a “before picture” and an “after picture.” We are sold by the extraordinary improvements. The “before picture” and “after picture” are also a powerful way to make known the value of risk management. Let’s look at one way to create pictures of our risk exposure for projects, programs, portfolios, and enterprises. The first step to turning risk assessments into pictures is to assign risk levels. Assume that a Project Manager is using a qualitative rating scale of 1 to 10, 10 being the highest, to rate Probability and Impact. The Risk Score is calculated by multiplying Probability x Impact. 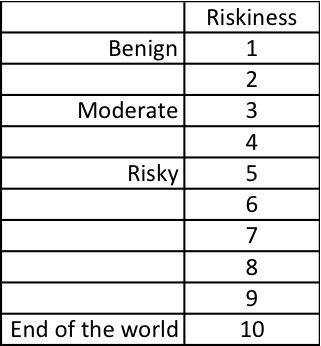 Here is an example of a risk table with a level of risk and the corresponding risk score range. Imagine a Project Manager facilitates the initial risk identification and assessment. The initial assessment results in fifteen Urgent Risks – eight “High” risks and seven “Very High” risks. We decide to act on the Urgent Risks alone and leave the remaining risks in our Watch List. The team develops risk response strategies for the Urgent Risks such as ways to avoid and mitigate threats. After the project team executes the strategies, the team reassesses the risks. We see a drop in the number of Urgent Risks (lighter bars). The team has reduced the risk exposure and improved the potential for success. Now, imagine a Program Manager managing four projects in a program. We can roll up the risks of the four projects into a single view. 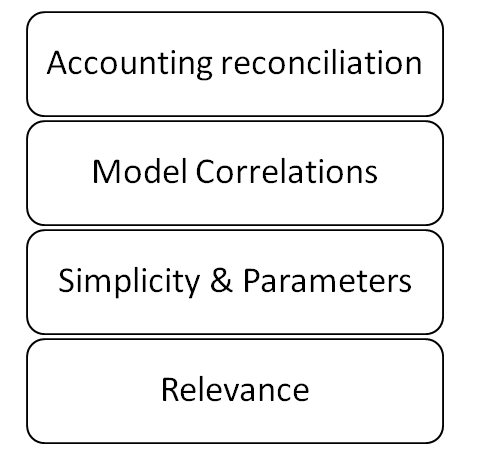 Figure 4 below illustrates the comparison of the number of risks before and after the execution of the risk strategies. Of course, we can also illustrate risks in a like manner at a portfolio level or an enterprise level (i.e., Enterprise Risk Management). When you ask team members to rate risks, it is important we specify whether the team members are assessing the “before picture” (i.e., inherent risks) or the “after picture” (i.e., residual risks) or both. Inherent risks are risks to the project in the absence of any strategies/actions that might alter the risk. Residual risks are risks remaining after strategies/actions have been taken. 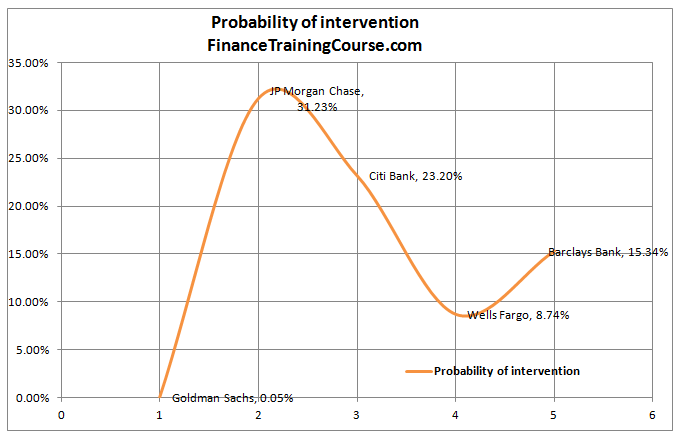 Question: What types of charts or graphics do you use to illustrate the value of risk management? Both the COSO and ISO risk management frameworks describe many excellent practices. However, in practice, insurers need to make two major changes from the typical COSO/ISO risk management process to achieve real ERM. RISK MEASUREMENT – Both COSO and ISO emphasize what RISKVIEWS calls the Risk Impressions approach to risk measurement. That means asking people what their impression is of the frequency and severity of each risk. Sometimes they get real fancy and also ask for an impression of Risk Velocity. RISKVIEWS sees two problems with this for insurers. First, impressions of risk are notoriously inaccurate. 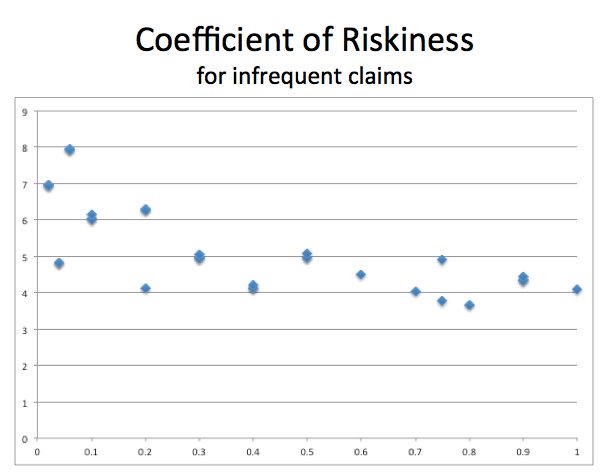 People are just not very good at making subjective judgments about risk. Second, the frequency/severity pair idea does not actually represent reality. The idea properly applies to very specific incidents, not to risks, which are broad classes of incidents. Each possible incident that makes up the class that we call a risk has a different frequency severity pair. There is no single pair that represents the class. Insurers risks are in one major way different from the risks of non-financial firms. Insurers almost always buy and sell the risks that make up 80% or more of their risk profile. That means that to make those transactions they should be making an estimate of the expected value of ALL of those frequency and severity pairs. No insurance company that expects to survive for more than a year would consider setting its prices based upon something as lacking in reality testing as a single frequency and severity pair. So an insurer should apply the same discipline to measuring its risks as it does to setting its prices. After all, risk is the business that it is in. HIERARCHICAL RISK FOCUS – Neither COSO nor ISO demand that the risk manager run to their board or senior management and proudly expect them to sit still while the risk manager expounds upon the 200 risks in their risk register. But a highly depressingly large number of COSO/ISO shops do exactly that. Then they wonder why they never get a second chance in front of top management and the board. However, neither COSO nor ISO provide strong enough guidance regarding the Hierarchical principal that is one of the key ideas of real ERM. COSO and ISO both start with a bottoms up process for identifying risks. That means that many people at various levels in the company get to make input into the risk identification process. This is the fundamental way that COSO/ISO risk management ends up with risk registers of 200 risks. COSO and ISO do not, however, offer much if any guidance regarding how to make that into something that can be used by top management and the board. In RISKVIEWS experience, the 200 item list needs to be sorted into no more than 25 broad categories. Then those categories need to be considered the Risks of the firm and the list of 200 items considered the Riskettes. Top management should have a say in the development of that list. It should be their chooses of names for the 25 Risks. The 25 Risks then need to be divided into three groups. 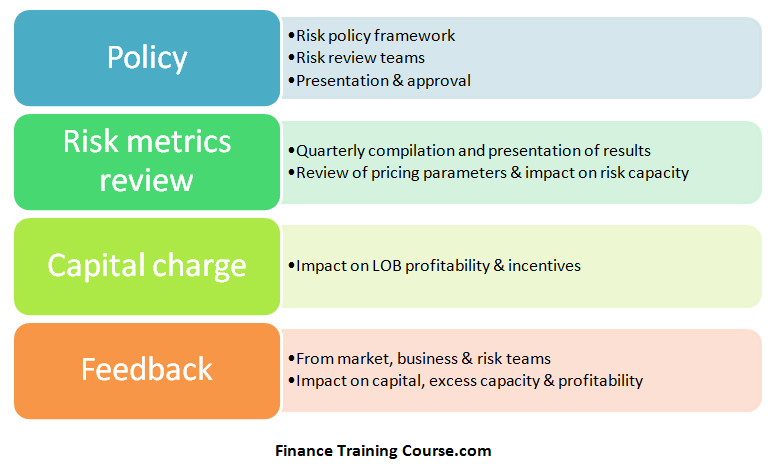 The top 5 to 7 Risks are the first rank risks that are the focus of discussions with the Board. Those should be the Risks that are most likely to cause a financial or other major disruption to the firm. Besides focusing on those first rank risks, the board should make sure that management is attending to all of the 25 risks. The remaining 18 to 20 Risks then can be divided into two ranks. The Top management should then focus on the first and second rank risks. And they should make sure that the risk owners are attending to the third rank risks. Top management, usually through a risk committee, needs to regularly look at these risk assignments and promote and demote risks as the company’s exposure and the risk environment changes. Now, if you are a risk manager who has recently spent a year or more constructing the list of the 200 Riskettes, you are doubtless wondering what use would be made of all that hard work. Under the Hierarchical principle of ERM, the process described above is repeated down the org chart. The risk committee will appoint a risk owner for each of the 25 Risks and that risk owner will work with their list of Riskettes. If their Riskette list is longer than 10, they might want to create a priority structure, ranking the risks as is done for the board and top management. But if the initial risk register was done properly, then the Riskettes will be separate because there is something about them that requires something different in their monitoring or their risk treatment. So the risk register and Riskettes will be an valuable and actionable way to organize their responsibilities as risk owner. Even if it is never again shown to the Top management and the board. These two ideas do not contradict the main thrust of COSO and ISO but they do represent a major adjustment in approach for insurance company risk managers who have been going to COSO or ISO for guidance. It would be best if those risk managers knew in advance about these two differences from the COSO/ISO approach that is applied in non-financial firms. Running around waving your arms and screaming “the Sky is Falling” is one way to communicate risk positions. But as the story goes, it is not a particularly effective approach. The classic story lays the blame on the lack of perspective on the part of Chicken Little. But the way that the story is told suggests that in general people have almost zero tolerance for information about risk – they only want to hear from Chicken Little about certainties. But insurers live in the world of risk. Each insurer has their own complex stew of risks. Their riskiness is a matter of extreme concern. Many insurers use complex models to assess their riskiness. But in some cases, there is a war for the hearts and minds of the decision makers in the insurer. It is a war between the traditional qualitative gut view of riskiness and the new quantitative view of riskiness. One tactic in that war used by the qualitative camp is to paint the quantitative camp as Chicken Little. 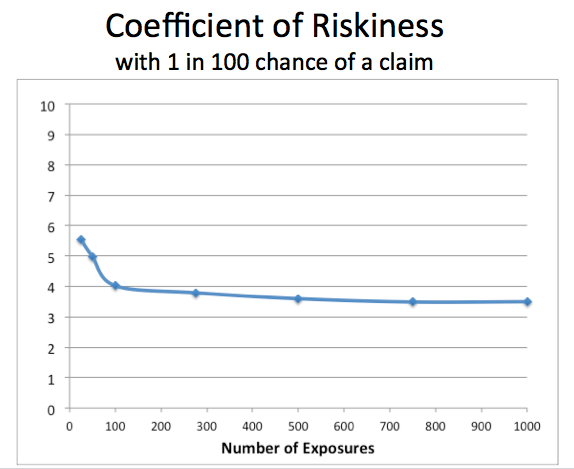 In a recent post, Riskviews told of a scale, a Coefficient of Riskiness. The idea of the COR is to provide a simple basis for taking the argument about riskiness from the name calling stage to an actual discussion about Riskiness. For each risk, we usually have some observations. And from those observations, we can form the two basic statistical facts, the observed average and observed volatility (known as standard deviation to the quants). But in the past 15 years, the discussion about risk has shifted away from the observable aspects of risk to an estimate of the amount of capital needed for each risk. 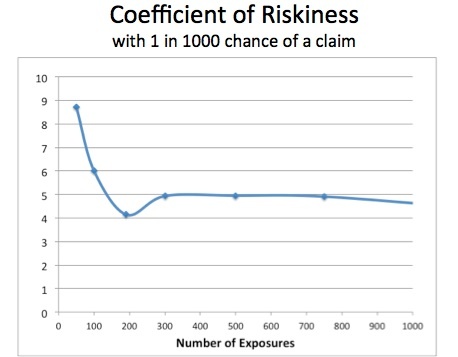 Now, if each risk held by an insurer could be subdivided into a large number of small risks that are similar in riskiness for each (including size of potential loss) and where the reasons for the losses for each individual risk were statistically separate (independent) then the maximum likely loss to be expected (99.9%tile) would be something like the average loss plus three times the volatility. It does not matter what number is the average or what number is the standard deviation. RISKVIEWS has suggested that this multiple of 3 would represent a standard amount of riskiness and become the index value for the Coefficient of Riskiness. 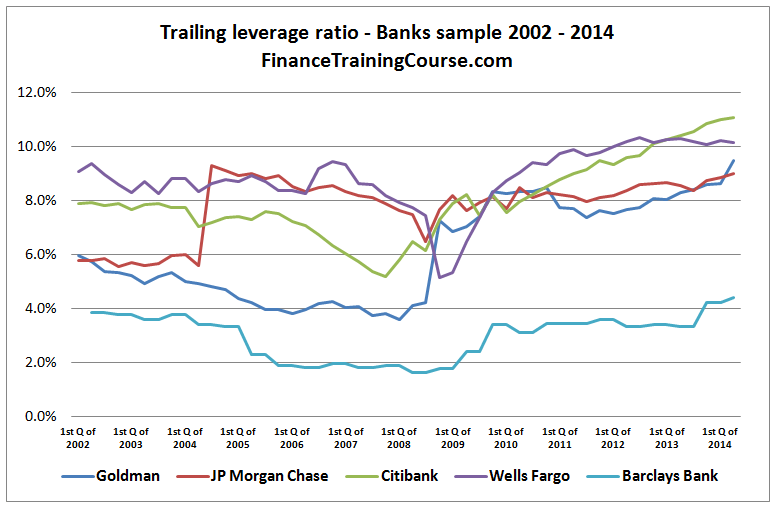 This could also be a starting point in looking at the amount of capital needed for any risks. Three times the observed volatility plus the observed average loss. (For the quants, this assumes that losses are positive values and gains negative. If you want losses to be negative values, then take the observed average loss and subtract three times the volatility). So in the debate about risk capital, that value is the starting point, the minimum to be expected. So if a risk is viewed as made up of substantially similar but totally separate smaller risks (homogeneous and independent), then we start with a maximum likely loss of average plus three times volatility. 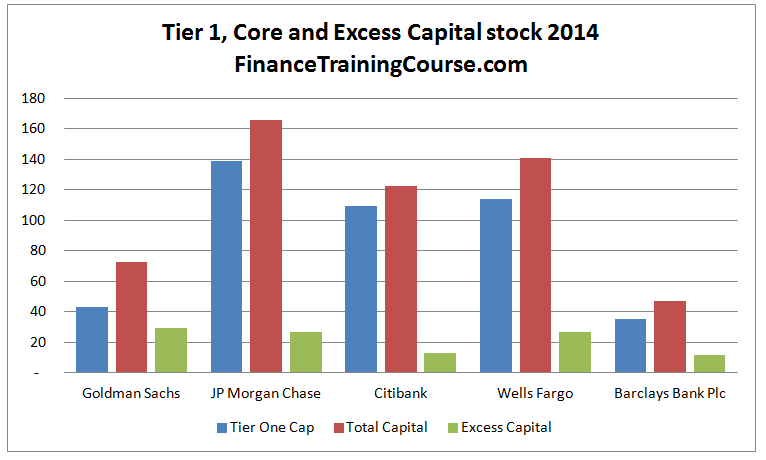 Many insurers choose (or have chosen for them) to hold capital for a loss at the 1 in 200 level. That means holding capital for 83% of this Maximum Likely Loss. This is the Viable capital level. Some insurers who wish to be at the Robust level of capital will hold capital roughly 10% higher than the Maximum Likely Loss. Insurers targeting the Secure capital level will hold capital at approximately 100% of the Maximum Likely Loss level. But that is not the end of the discussion of capital. Many of the portfolios of risks held by an insurer are not so well behaved. Those portfolios are not similar and separate. They are dissimilar in the likelihood of loss for individual exposures, they are dissimilar for the possible amount of loss. One way of looking at those dissimilarities is that the variability of rate and of size result in a larger number of pooled risks acting statistically more like a smaller number of similar risks. So if we can imagine that evaluation of riskiness can be transformed into a problem of translating a block of somewhat dissimilar, somewhat interdependent risks into a pool of similar, independent risks, this riskiness question comes clearly into focus. Now we can use a binomial distribution to look at riskiness. The plot below takes up one such analysis for a risk with an average incidence of 1 in 1000. You see that for up to 1000 of these risks, the COR is 5 or higher. The COR gets up to 6 for a pool of only 100 risks. It gets close to 9 for a pool of only 50 risks. There is a different story for a risk with average incidence of 1 in 100. COR is less than 6 for a pool as small as 25 exposures and the COR gets down to as low as 3.5. You see that the COR stays below 4.5 for expected claims 1 or greater. 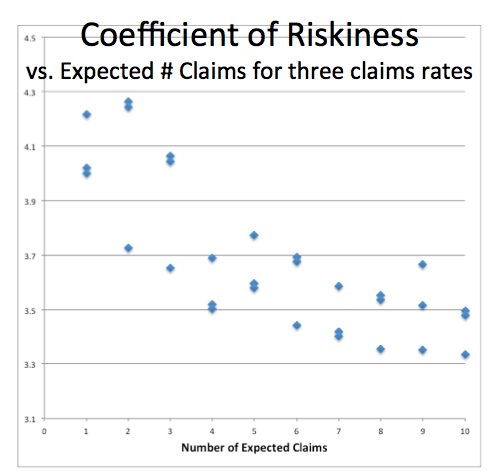 And there does seem to be a gently sloping trend connecting the number of expected claims and the COR. So for risks where losses are expected every year, the maximum COR seems to be under 4.5. When we look at risks where the losses are expected less frequently, the COR can get much higher. Values of COR above 5 start showing up with expected losses that are in the range of .2 and values above .1 are even higher. What sorts of things fit with this frequency? Major hurricanes in a particular zone, earthquakes, major credit losses all have expected frequencies of one every several years. So what has this told us? 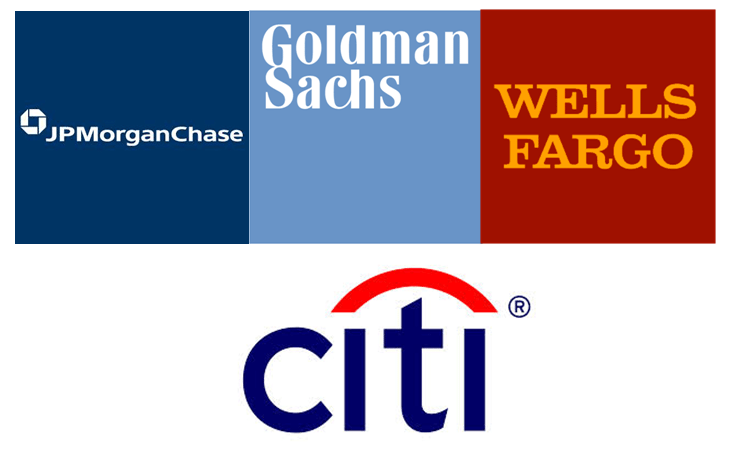 It has told us that fat tails can come from the small portfolio effect. For a large portfolio of similar and separate risks, the tails are highly likely to be normal with a COR of 3. For risks with a small number of exposures, the COR, and therefore the tail, might get as much as 50% fatter with a COR of up to 4.5. And the COR goes up as the number of expected losses goes down. Risks with very fat tails are those with expected losses less frequent than one per year can have much fatter tails, up to three times as fat as normal. So when faced with those infrequent risks, the Chicken Little approach is perhaps a reasonable approximation of the riskiness, if not a good indicator of the likelihood of an actual impending loss.